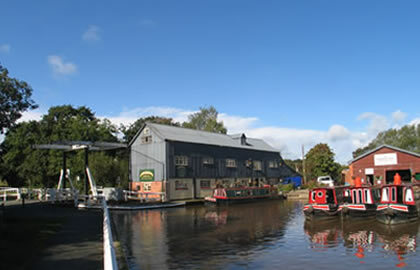 This three day cruise takes you through some beautiful countryside along the Llangollen Canal, in Shropshire, past the old Roman town of Whitchurch cruising through the small staircase locks at Grindley Brook and onwards to Marbury, before reaching Wrenbury. 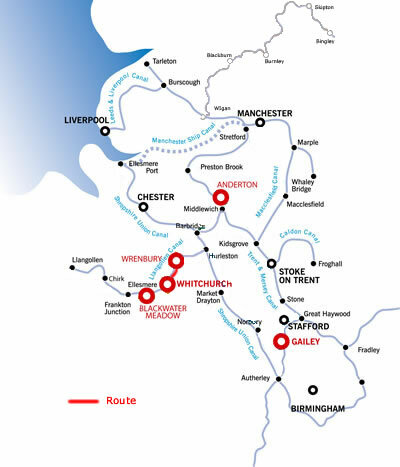 Leaving Whitchurch Marina, you will be cruising north, towards Grindley Brook locks, a famous staircase of locks. Once through the locks, cruise on to Jackson's Bridge No. 26, where you can moor for the night. There is a pub nearby called The Horse and Jockey, where you might like to have a meal, or maybe just a drink, before settling down for your first night aboard. You will have navigated 6 locks and cruised 2 miles in around 2 hours. Once you leave the mooring, you will soon encounter Povey's Lock, then Willeymoor Lock, where you will find a conveniently placed pub, canalside, called The Willeymoor Lock Tavern. One more lock, then the canal veers sharply to the right towards Marbury Lock. The village of Marbury is a short walk from the canal, and is well worth visiting if you like traditional villages with old and timbered buildings. All the while, you are cruising through peaceful countryside, and navigating pretty lift bridges, and soon you will reach Wrenbury Lift Bridge No. 20, where you can moor up, if you wish, and visit Wrenbury. There is much of interest here, with old buildings and the remains of Combermere Abbey, dating from 1133. A pretty green in the village centre is surrounded by 'magpie cottages'. You will need to turn the boat in preparation for the return journey. You will have navigated 4 locks and cruised 7 miles in around 4¼ hours. The return journey to Whitchurch should take you around 7 hours.